Measurements: 2.75 x 5 inches; or 70 x 126 millimeters. Back of card: Large diamond with angel wings in center, roses in the outside corners, gray blue on white background. Book included: Yes, 115 pages, 4 x 6 inches; or 100 x 153 millimeters. Unlike most books of this size, there are no illustrations in it. Publisher: Harper SanFrancisco. Printed in Singapore. Comments: Though there are many kinds of angels, these are Kabalistic/Christian in name & origin. The Fool, for example, is Adamel, "the Fool who attained knowledge". He holds an apple in his hands & it's not too hard to see him as the Biblical Adam, especially when one remembers the Arabic/Spanish word for "the" is "el" & that's the tag on the end of "Adamel". Though some suspect Adam later turned up as Christ & as I've mentioned elsewhere on this site, the figure on the Magician card is Christ, in this deck, the Magician is Abraxas with delightfully suggestive symbolism. As for symbolism, in this deck the Hanged Man is itself inserted upside down (check your deck carefully as you unwrap it). In the Major Arkana is Mary, Queen of Angels & Satan, too, but there is no Jesus nor Christ cards. Seems as if he's still too touchy to get mentioned directly. In the minor arkana, the suits are Hearts, Diamonds, Clubs & Spades. Court cards include the Lady, Knight, Queen & King. 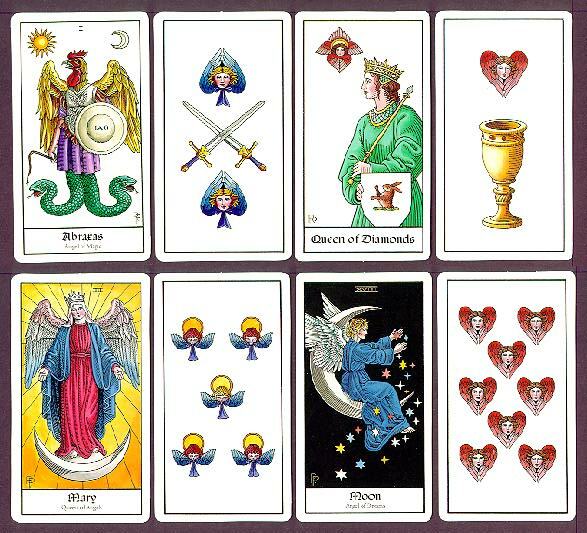 As for the numbered cards, this is a Marseilles-type deck with only the required number of symbols on the cards, so, as we've mentioned elsewhere, you'll need to know your number symbolism to use this deck, a deck which we find delightful.